As your Personal Stylist, I will make sure you understand how to flatter your figure and sharpen your overall look, without giving up the things that show off your fabulous personality. Discover the fabrics, patterns, and cuts that accentuate your best qualities and make you comfortable in your own skin. Each styling session will be customized to work within your interests, needs, and budget. I am as happy at Target as I am at Saks! An important step that is too often overlooked, any effective style consultation must begin with an evaluation of your current wardrobe. At our second meeting, you have some options, depending on the goals we set. Some clients choose to focus on creating “new” outfits by shopping in their own closets. You might be amazed at what’s in there! Others prefer to do more of a closet cleanout, where we go through your closet, piece by piece, deciding what to keep, what to alter, and what to donate. Regardless of how we decide our time together is best spent, I will create a prioritized list of what to add in order to make your wardrobe work for you. You will also get organizational advice to make your morning routine easier, faster, and more pleasant. No more staring endlessly at your closet-full-of-clothes-with-nothing-to-wear! If you enjoy shopping and you have time, we will explore the stores together to fill in the gaps in your wardrobe. 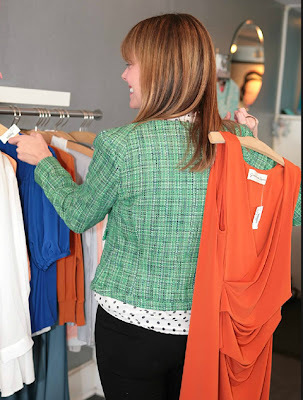 As a team, we will comb through the racks and put together stunning ensembles. You will learn how to shop more efficiently with amazing results. The number of stores is up to you, depending on your own schedule and interest. Do you hate shopping (or have no time for it) and wish the perfect clothes would magically appear in your closet? Wish no more! Send me out on your behalf to select items from local boutiques and department stores, in addition to online retailers. You will get the clothes delivered directly to your door. You keep the pieces that work for you, and I will return or exchange anything that doesn’t! It’s as simple as that. Best of all, to further ease your morning routine, you will get a personalized lookbook, containing pictures of complete outfits. If you’re too tired or hurried to figure out what goes together, just open your lookbook, choose an outfit, and put it on. Voila—instant style! *Image taken at Pink in Richmond, Virginia.